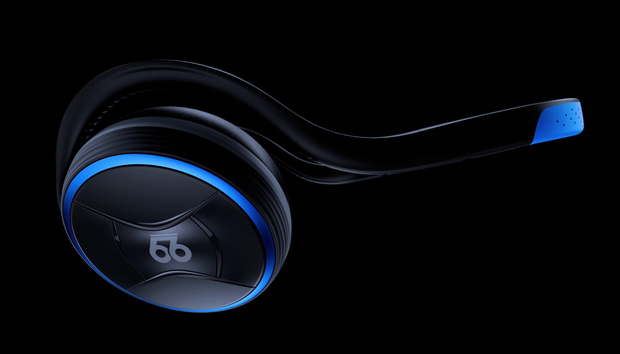 If you liked the concept of ONvocal’s OV Bluetooth headset, but skipped it because you didn’t like the combination of in-ear headphones and a neckband, you’ll want to check out 66 Audio’s Pro Voice cans. These on-ear headphones host only Amazon’s Alexa (the OV supported Alexa, Google Assistant, and Siri), but they’re simpler to operate, far more comfortable to wear, and—most importantly—they sound better. The Pro Voice are clearly designed for audio performance first. They sound much better than you’d expect for their $140 price tag. The fact that you can use them to summon Alexa to do your bidding—be it controlling your smart home, reminding you of your day’s appointments, or playing your daily flash briefing—is just the icing on a sweet sonic cake. But I’ll discuss Alexa integration first, since it’s probably the reason you’re considering—or are at least curious about—these headphones. You can summon Alexa at any time the Pro Voice headphones are connected to your smartphone, your smartphone is running 66 Audio’s MotionControl app, and it’s connected to the internet. The tiny onboard mic will hear the wake word even if you’re in a loud environment or you’re listening to tunes with the volume cranked. I tried it while standing behind my stove with a powerful vent hood running on “boost” mode, and it summoned Amazon’s digital assistant every time. 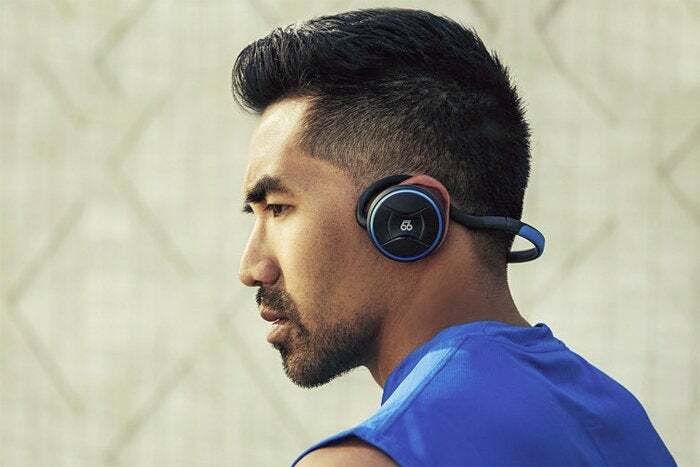 The on-ear Pro Voice have a band that wraps around the back of your head (the logo is necessarily upside down in this photo). 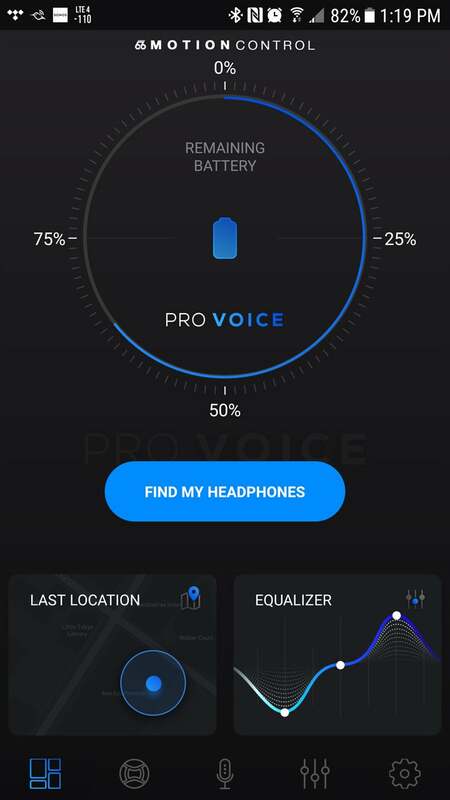 Launch the app and it will immediately display the information you'll want most: How much life remains in the Pro Voice's battery. Kay said the company spent 14 months tuning the Pro Voice’s 24-bit DSP by having people with laptops sit in real-world conditions—such as at a gym—saying “Alexa” for hours at a time. “This allowed us to ‘train’ the DSP to identify not only the environment, but the actual acoustic patterns,” Kay said. Once you have Alexa’s attention—you’ll hear two short beeps within two to three seconds—you can ask Alexa to do most of the same things you can do with an Echo speaker. You can play music through Amazon’s services, iHeartRadio, or TuneIn Radio, and get album art in the MotionControl app (support for Spotify and Pandora are coming soon, according to Kay); control any of your smart home devices; get weather forecasts; play your daily briefing; and more. Some Alexa functions are outside of the Pro Voice’s control, however. You can’t use the headset to initiate phone calls via Alexa, for example, because Amazon has not yet enabled that feature for headsets in its API (it’s in development, according to Kay). The API doesn’t support recording reminders, either, but you can make lists. Finally, these headphones don’t support Amazon’s ESP (Echo Spatial Perception), which helps multiple Echos determine which one should respond to your voice. You’ll want to mute the mic on a nearby Echo if you intend to use the headphones for smart home control. The Pro Voice rest on top of your ears, with a flexible band that rests on top of your ears and wraps around the back of your head. The band is fabricated from a trio of materials: The ear cups are ABS plastic, the hooks holding the ear cups are made from thermoplastic polyurethane (TPU), and the rear band is blend of injection-molded silicone and TPU. 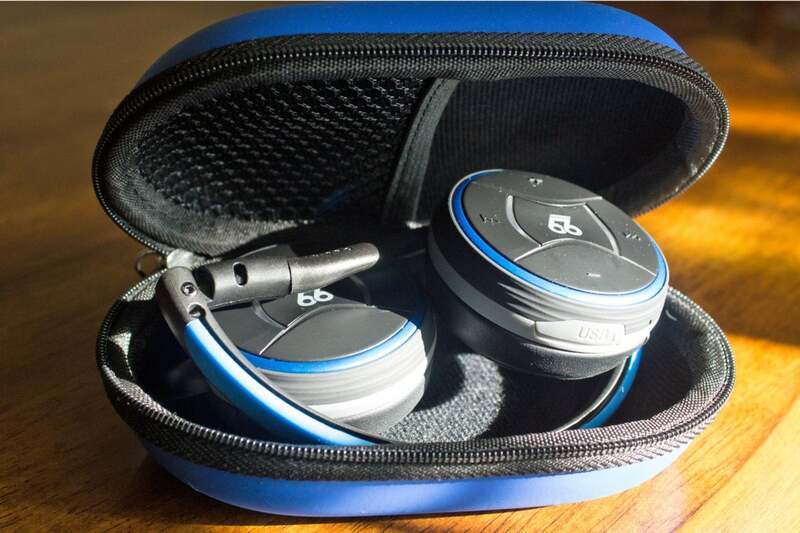 The cushions on the ear cups are made from two layers of memory foam covered in faux leather. The headphones fold up into a very compact package to fit in the provided semi-hard zippered case, which has a mesh pocket inside to store the provided 27-inch USB-C charging cable. 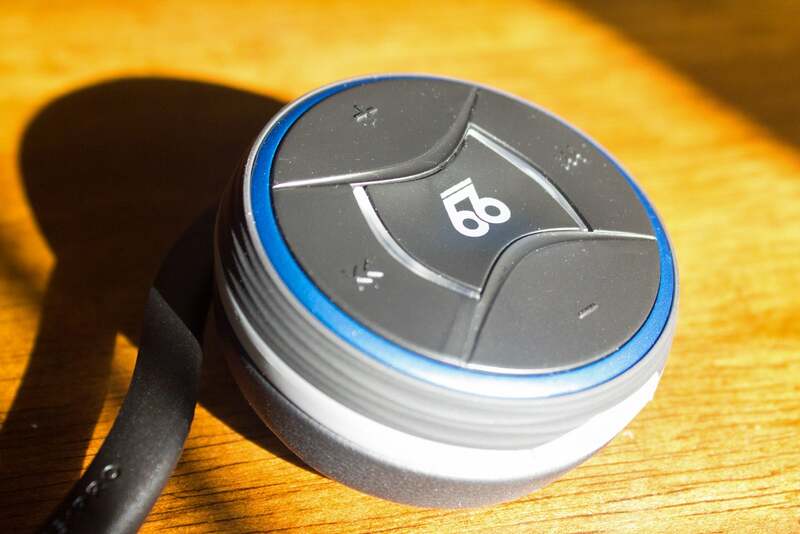 66 Audio's marketing materials emphasize wearing the Pro Voice while excercising and being active, but couch potatoes will get plenty of enjoyment from them, too. A firm grip ensures the headphones won’t slip or fall off—even while exercising—but I found the fit to be just a bit too tight. I couldn’t wear them for long listening sessions because they exerted too much pressure on my outer ears after an hour or so. But for me, that’s true of most on-ear headphones (Bowers & Wilkins’ exquisite P5 wired headphones are a notable exception). As a child, I had plastic surgery to correct the shape of my outer ears, which left scar tissue on the backs of them. For that reason, I much prefer circumaural phones because they fit around outer ears. The tight fit shouldn’t be a problem for most people, so I didn’t take it into account when computing my verdict. Three of the five buttons on the right-hand ear cup serve dual functions, determined by a single or double press. You push the center button once to toggle between playing and pausing your music. If you don’t want to summon Alexa with a voice command, a double-press will do it for you. A short press on the left button (away from your head) takes you to the previous track, and a long press rewinds the current track. A short press on the right button (toward your face) skips to the next track in your queue, and a long press fast-forwards through the current track. These buttons also work with other audio content, such as your flash briefing or weather forecast. To control the volume, you press the top button to raise it and the lower button to lower it. Holding the lower button down will mute a call. Five buttons on the right-hand ear cup control all of the Pro Voice's basic functions. The Pro Voice sound great! The Pro Voice have 36mm drivers with neodymium magnets. They support both AAC and aptX as well as FLAC, MP3, and other common codecs. After many hours listening to music on the Pro Voice in various environments, I came away impressed with their audio performance considering their size and price tag. The finger snaps on Sam Smith’s “Too Good at Goodbyes,” from his album The Thrill of it All streamed via Tidal, sounded crisp and natural, and Smith’s voice—and the soaring choir backing him up—came through beautifully. 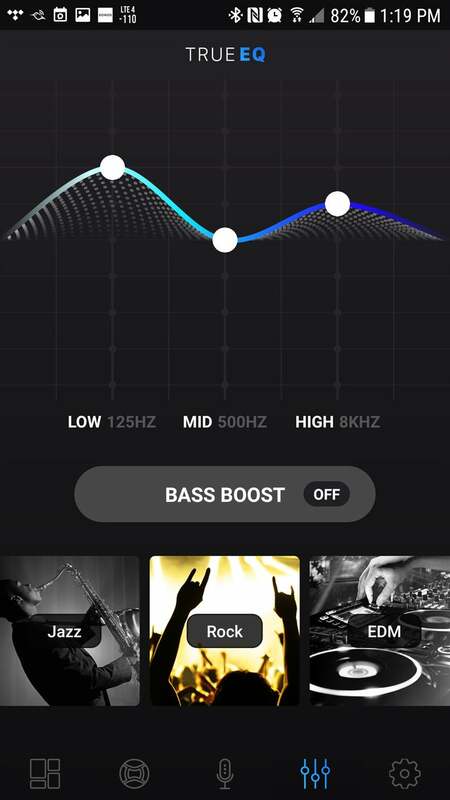 The guitar accents drum strikes had a satisfyingly long decay, and bass response was surprisingly strong..
66 Audio's MotionControl app provides nine EQ presets, but you can customize and save any of these after you drag the three dots representing low, mid-range, and high frequencies. 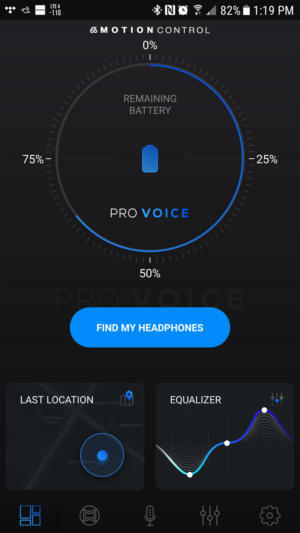 You’ll find 66 Audio’s focus on sound quality is also well represented in the company’s MotionControl app, which is available for Android and iOS. The name is a little confusing, because it invokes the concept of gesture control, but the app is very well designed and offers a terrific set of EQ controls. The default EQ preset is flat, as expected, but it became my favorite over time. The Pro Voice just don’t need a lot of after-the-fact equalization to sound great. If you don’t agree, you’ll also find EQ presets for Jazz, Rock, EDM, Pop, Rap, R&B, and Country, along with one that’s just called Chill. You can create and save your own custom EQ presets by starting with any one of these and dragging dots for low, mid, and high frequencies up or down along a curve. If you just want to add a little low-end oomph, touching the Bass Boost button will scratch that itch. The app’s launch screen provides a large visual representation of the headphones’ remaining battery life. And if you’ve misplaced them, touching the Find My Headphones button will cause them to emit a tone to help you find them in the couch cushions or wherever they might be. If you still can’t find them, a Last Location button will pinpoint on a map the address where your smartphone last had contact with them. The Pro Voice fold up to fit inside the included 5.5- inch wide, 3.25-inch deep, 2-inch thick case. Are the Pro Voice a good value? 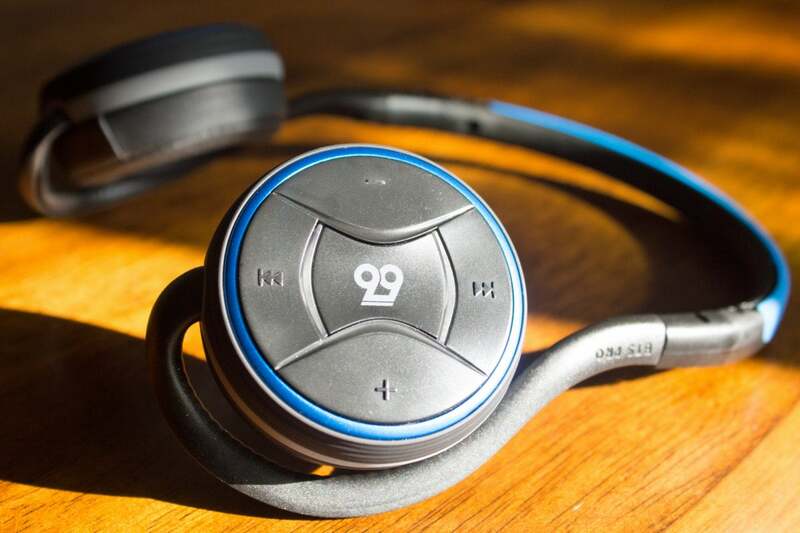 66 Audio’s marketing materials emphasize how good the Pro Voice are for active people, but these headphones are great for more than just fitness fanatics who want to listen to music while they work out. They deliver an exceptional audio performance for the money, and they do a better job of tapping Amazon’s Alexa digital assistant than any mobile (non-speaker) device I’ve encountered. Highly recommended.